The African Book Review met with finalists for The Brunel University African Poetry Prize to discuss their poems, inspirations, and hopes for the future of African Poetry. 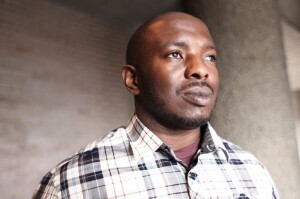 Here’s our interview with Nick Makoha, a poet from Uganda, whose powerful poem “Beatitude,” dwells on the pain of refugees forced to leave their country. MAKOHA: Writing for me has never really been a hobby. It is something that I have done since I was a child. Initially I was inspired by the ability to play with words, to use language as a puzzle. It became my playground, something I did without thinking just for the joy of it. But as I moved from country to country leaving my homeland of Uganda, language became something else: it became a refuge. It also became a place where I could reap the harvest of my emotions…. In my ignorance I assumed everyone wrote poetry. I wrote my first public poem for a math teacher that died of a heart attack at my boarding school in Kenya. I remember crying under a tree and thinking there must be a better way to remember him. He had been a pillar of support and writing a poem was the only way I could find in my 14 year old self to honour him. The poem was published in our yearbook and it was the first time I was called upon by my community to be a poet of the people. So to answer your question, I would say what inspires me to write is a strong conviction or the welling up of emotion. The skill is to identify these convictions when camouflaged by ego, stereotypes and day-to-day living. My collection The Second Republic was inspired by my need to return emotionally to Uganda. I am describing a metic experience, a foreigner living in a land that is not his own. A person in exile is a person between two worlds, where language becomes the conduit through which emotion is expressed. ABR: Your poem “Beatitude,” which is a finalist for the Brunel University African Poetry prize, touches on an everyday (almost casual) violence as the backdrop to a country that is unstable. The lines “Run past sleep, past darkness visible./ Stop when you find a country where they do not know your name,” are especially powerful. Can you talk a bit about the inspiration for this poem and what it’s representative of? MAKOHA: “Beatitude” is a perfect example of the metic experience. This poem came as one stream of consciousness. I really had to stop myself from writing it. It is a capstone in my poetry collection in that it holds a hidden pain which I really discuss about leaving my country. It also sets up the cinematic landscape of the world I want my reader to inhabit; a world that does not belong to the European consciousness. It is a world that runs parallel to the world we live in right now. In today’s culture there is a cynical view of the refugee or the asylum seeker but I wanted to give a clear understanding of what many people around the world suffer in a matter of fact way. Beatitudes are the blessings that Jesus gave in the bible. I wanted to communicate that for many leaving their beloved it homeland and running to freedom is a blessing at the cost of losing all. ABR: As a Ugandan poet, how has Uganda influenced your works, and what do you think the future of poetry in Uganda is? What ideally would you like it to be? MAKOHA: Most of my life has been spent out of Uganda. So my Ugandan influences are indirect or subliminal. The writing of these poems has brought me closer to my culture as I have investigated my heritage through literature. Early on I read Okot p’Bitek and Okello Oculi. Most useful was leading the politics of many African writers from all genres. People like Ben Okri, Wole Soyinka, Ngugi Wa Thiong’o… their insights are like finding gold in a river. As for the future of Ugandan Poetry, I hope it is at the beginning of a great journey. A journey that brings great writers to the international stage. I hope I can play my part in doing that. ABR: Do you have any favorite African books? Any that have particularly influenced you or that you just love for some reason? MAKOHA: If by favourite African books you mean books that I come to again and again there are many; Of Chameleons and Gods, any play by Athol Fugard as his works hold up to any generation. This week I am reading Jack Mapange’s Beasts of Nalunga. ABR: Thanks and congratulations on being a finalist for the Brunel University African Poetry Prize. MAKOHA: Thank you. It is a great honour of being picked as one of the finalists I feel privileged to be among their number. Born in Uganda, Nick Makoha fled the country with his mother during the Idi Amin’s regime. His debut pamphlet series, The Lost Collection of an Invisible Man was published in 2005 and he is currently working on his first full poetry collection. Nick represented Uganda in the Cultural Olympiad Poetry Parnassus at London’s Royal Festival Hall. His one-man show My Father & Other Superheroes debuted to sold-out performances in London, and a national tour begins at the end of 2014.